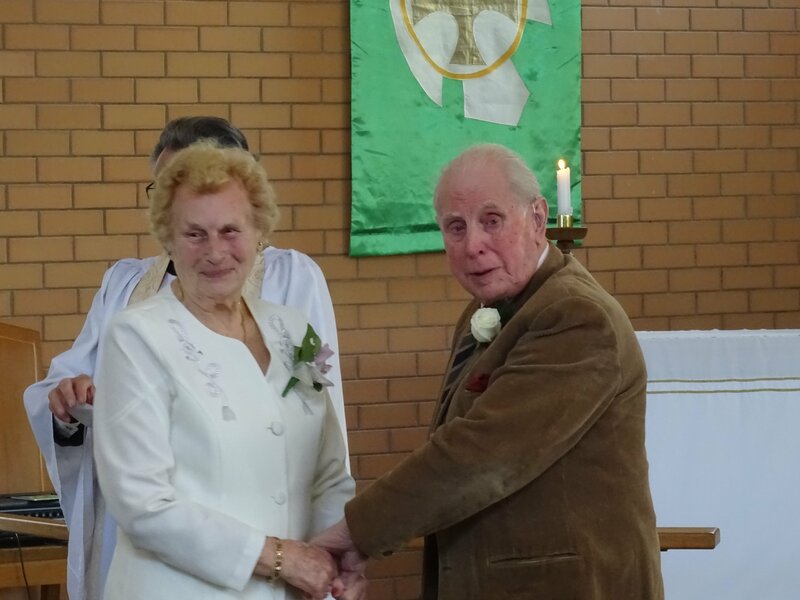 We had a lovely surprise at St Barnabas last week, when Rev Jack celebrated the marriage of Gladys Holliday and George Elston. I am grateful and give thanks to God for the blessings that God has given us in this parish. We have certainly had a chance to experience them these past couple of weeks. We sent off Bev Hinkley, a faithful member of this parish, in fine style at her funeral, and through our hospitality and small acts of kindness, we gave great pastoral care to her grieving family and friends. Even though the secret was tightly held, (although I nearly burst with it) we managed to organise Gladys and George’s wedding, with many people assisting without fully knowing what was going on. Thank you for your trust. This week, it is the turn of St Marks to witness a joyful pastoral service, when we welcome the parents, godparents and friends of young Scarlet Trotter. 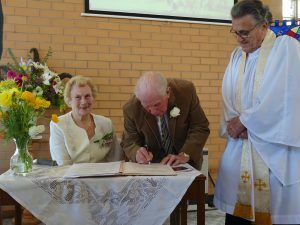 Birth, marriage and death. These are all parts of God’s plan for us, and for our small part in his bigger plan. Particularly in these days of instant communications, and short attention spans, playing our part in a long term project can be frustrating, if this is so, I have two recommendations for you. Give thanks to God in all you do. We are all destined to be part of God’s plan. How’s that for an ambitious opening statement? We are all destined to be part of God’s plan. And the readings this morning back me up on this bold statement. We hear about Moses, about Peter, and then St Paul gives us some instructions to help us to be useful to God and to our brothers and sisters. So Moses. …. I like the bit when God calls to Moses out of the burning bush. So Moses comes, and then God shouts Stop! Come no closer! Take off your shoes, for you are on hallowed ground! How confused must Moses have been? He was still getting used to seeing a bush in flames that wasn’t being consumed and then hearing a voice from it!! But having well and truly gained his attention, God tells Moses what he has to do, as part of God’s plan to save the Israelites. Just as we would, Moses protests that he isn’t qualified to lead a nation out of Egypt, but God just reassures him that he will not be alone. But was he really that unqualified? Actually, I reckon that God had him in mind all along. God needed someone who could walk into the Pharaoh’s palace and speak directly to the big man himself. He also needed someone who could speak for the Israelites, one of their own. Now, if Aaron, Moses’ brother had tried to walk in, Aaron, a member of the despised slave class, wouldn’t have made it past the front gate, never mind the front door. But remember that Moses was brought up as a Prince of Egypt by his adopted mother, the Pharaoh’s daughter. He was a familiar face in court, and would have very little trouble walking up to Pharaoh and addressing him directly, which of course was what happened. Although, the passage stops before it, Moses continued to protest to God about his inability to speak as a representative, so God told him to bring along Aaron, a natural leader of the Israelites to do the talking. But Moses is the key to getting in front of the PHARAOH. And God knew how to get the Israelites to trust him. He gave him some miracles to do, such as the stick that would turn into a snake when it was dropped onto the floor, but more powerfully, he had a track record of defending the Israelites. The reason that he was tending sheep in the first place was because he had a death warrant out against him and had fled Egypt. Many years before, he had killed an Egyptian overseer who was ill treating the Israelite slaves. So his experiences throughout his life had been building to this moment, he was a defender of the Israelites who had the ear of the Pharaoh, and with the support of his brother, he could demand that the people be set free …. Or else! And he had the Lord God, the God of Abraham, Isaac and Jacob on his side! What about you? How were you prepared to best serve God in your life? Peter didn’t have many ambitions. He was a husband and a fisherman, and catching as many fish without drowning seems to have been his ambition. He was a simple man, who spoke as he saw life, and he absolutely loved Jesus. He was a most faithful follower, even when it all got a bit weird. Do you remember last week when Jesus asked the disciples who they thought he was? He had the correct answer right up his sleeve, that just seemed to be inspired by the Holy Spirit. “You are the Messiah, the Son of God” he announced. Jesus was pleased that he had responded according to the Spirit. But like Moses, Peter was not Superman, he was human, and not perfect. Whereas Moses had been worried about having the right words to argue the case for the Israelites, Peter just couldn’t accept the version of the future that Jesus kept telling them. Surely? Surely if Jesus was the Messiah, he would want to stay with them forever, and save them from the Romans? Surely? Both men were told to give up their comfortable lives and to follow God, whatever the cost, for God would be there with them. Both men, despite some very rocky patches, led God’s people from slavery into freedom, one way or another. What do we need to do, to live as a disciple of Christ? Well, Paul gave us a list of actions that would help us to fulfil our promise to God to love God, neighbour and self. 9 Let love be genuine; hate what is evil, hold fast to what is good; 10 love one another with mutual affection; outdo one another in showing honour. 11 Do not lag in zeal, be ardent in spirit, serve the Lord. 12 Rejoice in hope, be patient in suffering, persevere in prayer.13 Contribute to the needs of the saints; extend hospitality to strangers. 14 Bless those who persecute you; bless and do not curse them. 15 Rejoice with those who rejoice, weep with those who weep. 16 Live in harmony with one another; do not be haughty, but associate with the lowly; do not claim to be wiser than you are. 17 Do not repay anyone evil for evil, but take thought for what is noble in the sight of all. 18 If it is possible, so far as it depends on you, live peaceably with all. Simply, we must be open to love, and almost all of the list I read will naturally fall into place. Our minds and our hearts will be changed, and God will be able to step past our human frailties, and uses us in a way that gives life to all around us.